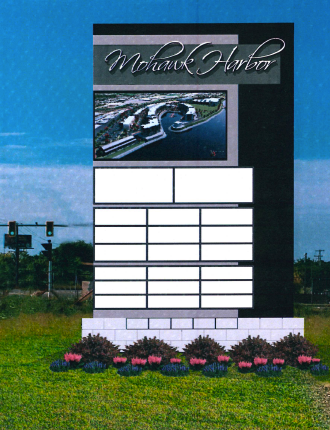 (November 15, 2017): I learned today that on November 1st, 2017, Board of Zoning Appeals granted Mohawk Harbor variances that would permit it to install a pylon sign 22′ tall and 122 sq. ft., at the location involved in the discussion below. 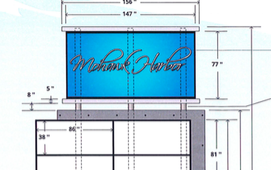 The Zoning Code permits a sign 7′ tall of 75 sq. ft. at that location. Had I known of the application, I would have strongly opposed it as presenting the same problems as the 30′ pylon rejected by BZA on October 6, 2017. Moreover, I learned late yesterday afternoon (Nov. 14), thanks to TU reporter Paul Nelson, that BZA had announced a special Meeting to be held tomorrow, November 16, in which Mohawk Harbor has resubmitted its previously rejected application for a 30′ pylon of 265 sq ft. The only difference is that it has given up asking for a 1′ setback instead of the required 3′ setback from the right of way. Click here for the Resubmitted 30′ pylon application. . . variance denied . .
MH representative Paul Fallati had asked BZA to allow a 265 square foot pylon sign, with a height of 30 feet, a message board 12 feet wide, and a 1 foot setback from the NYDOT right-of-way. The Board found that the requested variances were significant, not justified, and could adversely impact close properties. BZA refused to merely accept the Planning Commission’s actions in support of a 30′ design. 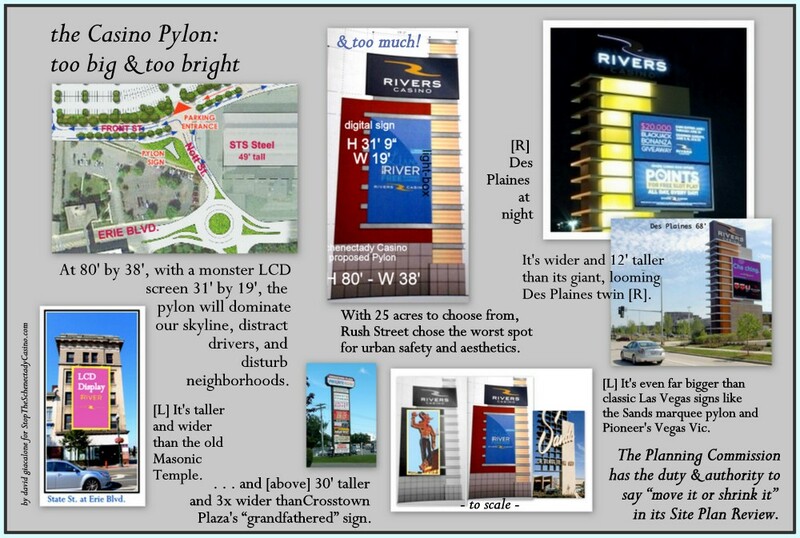 Click to see the odd and inadequate Variance Application for the Pylon Sign; also, the Variance Application for the Monument Sign, and a Site Plan illustration of the signage location and setbacks. A co-owner of Sev’s Luxury Used Car, located directly across the street from the proposed pylon on Erie Boulevard, pointed out to the Board the potential negative effects on nearby properties that desire to upgrade to more attractive uses, and asked if the large cement wall behind the proposed pylon was meant to protect Mohawk Harbor tenants from the glare of the bright pylon lights and screen. David Giacalone, proprietor of this website, stated that BZA should have made its own independent review of variance issues before the Planning Commission spent two months helping MH design a 30-foot sign for a 7-foot sign location. 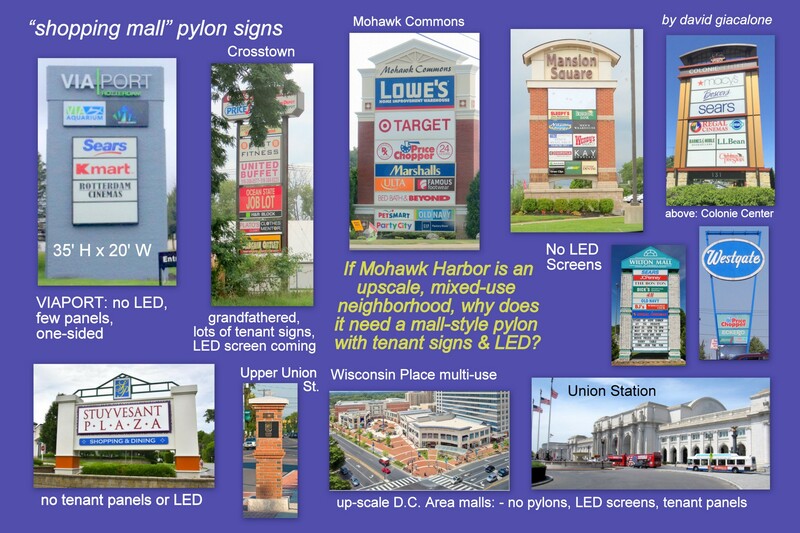 He also stressed that (1) Mohawk Harbor is asking for a shopping-mall-style sign despite touting the development as an upscale mixed-use residential and commercial neighborhood; he presented a collage (seen below) to make the point; (2) a large, bright sign so close to a busy, complicated roadway presents many safety issues, including distracting drivers (intentionally) and creating major glare; and (3) the Applicant could not show that its difficulty under the zoning code is not “self-created”, because Mohawk Harbor was intimately involved with drafting the revamping of the C-3 District rules two years ago, and specifically left the original C-3 signage limitations for non-casino signs. These and additional issues are more fully discussed below. [Earlier] BZA Update (October 4, 2017): This follow-up relates to the requests by Paul Fallati, on behalf of Mohawk Harbor, for area variances to permit the two signs at the Mohawk Harbor Way entrance to the complex. The matter is before the Board of Zoning Appeals for the first time this evening, October 4, 2017. 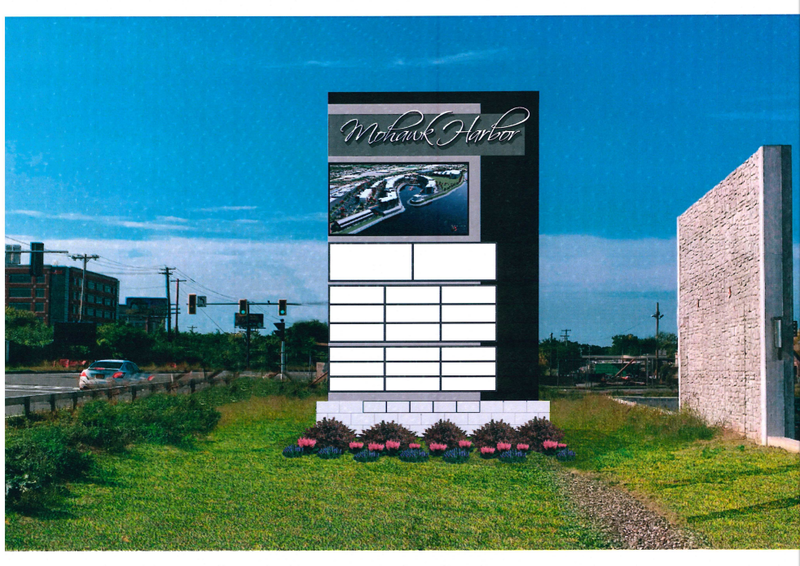 (Click to see the Variance Application for the Monument Sign, the Variance Application for the Pylon Sign, and a Site Plan illustration of the signage-intersection location and setbacks.) The issues are basically the same as discussed below regarding the appropriateness of the sign for the location, but the Board of Zoning Appeals should, I believe look closely at the statutory and code requirements for granting an area variance, and not let the Planning Commission preempt variance decisions, which places BZA in a rather awkward position. The Application for the Pylon Sign in no way meets the criteria for granting a variance. SUMMARY: First, the proposed signs are far larger than permitted for non-casino signs in the C-3 zone, and area variances must be obtained. On the merits, the placement of a large LED screen so close to a busy intersection and complicated roadway system is particularly worrisome from a safety perspective [from driver distraction and confusion, and glare], and the use of a shopping-center/strip-mall type pylon is contrary to the stated upscale aspirations of the developer and the goals of the City’s Waterfront zoning provisions. It cheapens the image of the Harbor Area, lessens the quality of life of residents in the vicinity, and reduces the attraction of adjacent property for higher use. 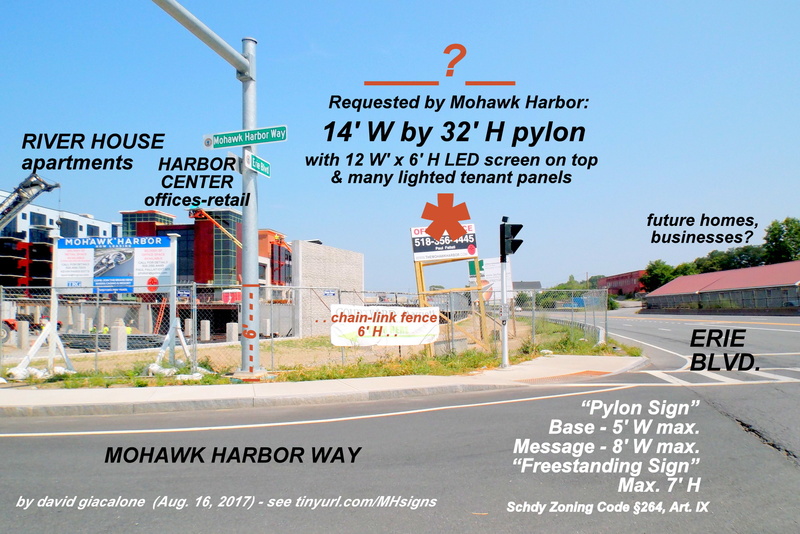 BELOW is a set of Updates to our post on August 4, 2017, “another sneaky pylon ploy“, on the proposed Mohawk Harbor pylon-style sign (14′ W by 32′ H, with an LED screen on top, 12′ W by 6′ H) and monument sign (40′ W by 10′ H), which are on the Schenectady Planning Commission agenda for August 16, 2017. In the Aug. 4th post, I argue that the signs are too large to be allowed in the C-3 district, because they are not casino-facility-related, and must comply with the normal regulations of Article IX of our Zoning Code. . .
As expected, the Commission declared itself the Lead Agency for purposes of SEQRA environmental review and adopted a negative impact statement. Interested Federal and State agencies, and the public may comment — e.g., statements about the impact of the signs on traffic safety, and nearby residents — over the next 30 days. In addition, the Commission correctly demanded detailed renderings showing the appearance, exact location, and orientation to the roadways, of the signs. Despite the statement to me by the Principal Planner earlier this week, Mohawk Harbor did not reduce the size of its proposed signs in deference to the need to seek a variance for each, which State law says must be the minimum increase required to meet the valid needs of the applicant. 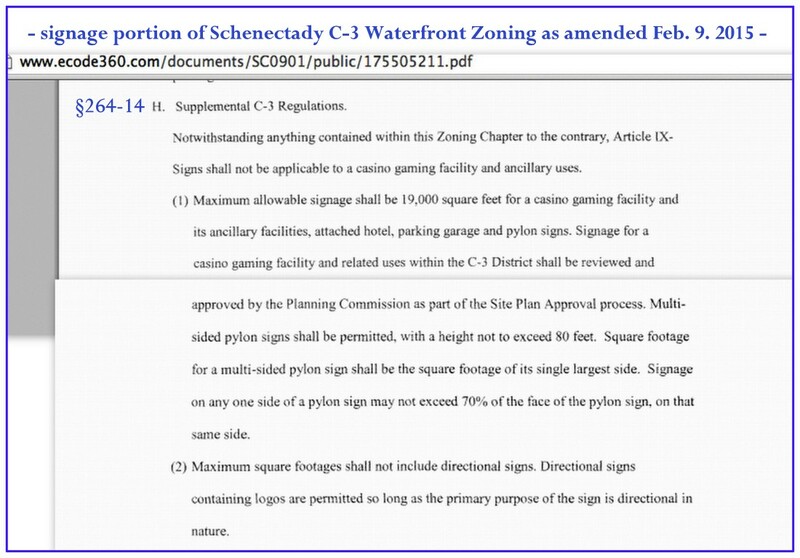 More worrisome, no Commission member spoke of the need for a variance, nor reminded Mohawk Harbor that only casino facility signs were exempted from the Zoning Code’s Article IX restrictions on the size of signs. Paul Fallati of the Galesi Group stated that one reason for such a large monument sign was to help screen out the sight of STS Steel. Commissioner Bradley Lewis correctly pointed out that the proposed large pylon does not actually have the name Mohawk Harbor prominently displayed, so as to alert drivers they are approaching the development. David Giacalone [proprietor of this website] stated that variances were needed, and that a large pylon with signs for 22 tenants would make upscale Mohawk Harbor look like any old shopping mall. [image to the right is Crosstown Plaza’s sign; with $480 million to spend, I am pretty sure the Lupe family would have developed a very tasteful plaza at Crosstown.] Giacalone reminded the Commission that they need to consider the safety elements of having a large LED screen, plus the lighted tenant signs, just a few feet from a busy road. 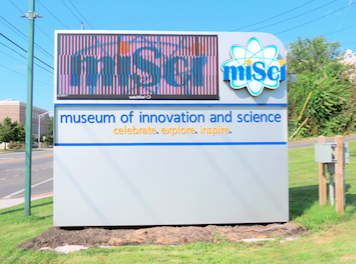 To my argument that the miSci sign on Nott Terrace is adequate as a branding sign at 12′ W by 10′ H (see discussion and images below), Mr. Fallati said the traffic is much faster on Erie Blvd. so drivers could not see 22 little signs on such a small structure. 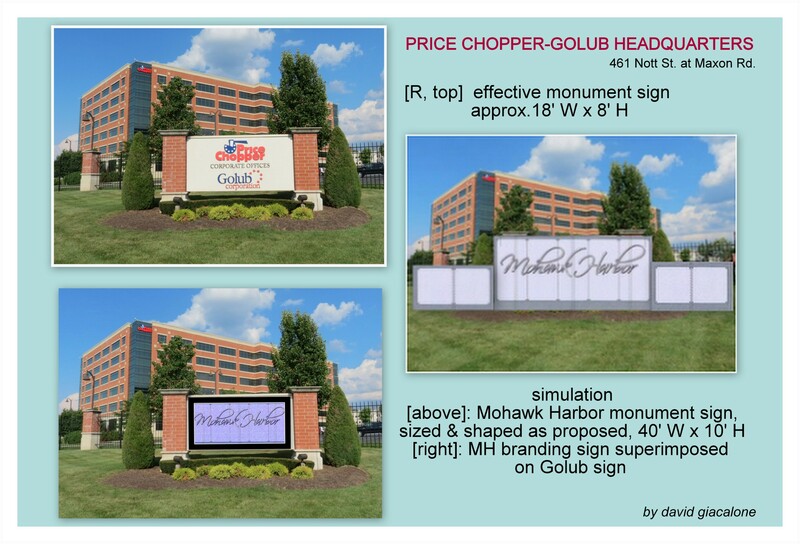 See “Decision on Mohawk Harbor signs put on hold” (Gazette, by Brett Samuels, Aug. 17, 2017). He apparently missed my argument that we do not need to have a cluster of tenant signs at all, and that 22 tenant signs would not be very informative no matter how large the pylon is — i.e., the Crosstown Plaza pylon is 14′ W and 50′ H (grandfathered in at that height) and passing traffic surely does not become well-informed about the tenants..
On 8/16 the Planning Commission will declare Lead Agency for the SEQR review which starts a 30 day window for interested parties (i.e., Mohawk Towpath Scenic Byway) and involved agencies (NYSDOT and Sch’dy BZA) to comment on the proposal. The Planning Commission will not take any other action on 8/16 other than to give their feedback on the design. It’s anticipated that on 9/20 the Planning Commission will take action to either issue denial or conditional approval of the proposal. If they issue approval, it must be conditioned upon approvals by NYSDOT and Sch’dy BZA. 10/4 Board of Zoning Appeals to review the area variances needed to allow the signs. . . above: proposed locations on either side of Mohawk Harbor Way at Erie Boulevard for the proposed monument sign [L] and pylon sign with LED screen atop. Click on each image for a larger version. Click here (for the Monument Sign) and here (for the pylon sign) to see the two Special Use Permit applications.
. . . For additional details, please see our Pylon Ploy posting about the two MH signage applications, including the submitted sketch images of the Pylon and Monument signs, and legal discussion of the need for variances due to the excessive height and square footage. The Planning Commission staff appears to agree that variances will be needed unless there are significant reductions, and is therefore contemplating referring the final proposals (relating to allowable dimensions) to the Board of Zoning Appeals for variance review, with possible action by BZA in October. Here is the Schedule I list of signage regulations in the various districts. Mohawk Harbor is, of course, in the C-3 Waterfront Mixed Use district, and Schedule I and all Article IX provision on Signs apply to the applications before the Commission, because they are not covered by the 2015 Amendments, which exemption granted to casino-facility-related signage. 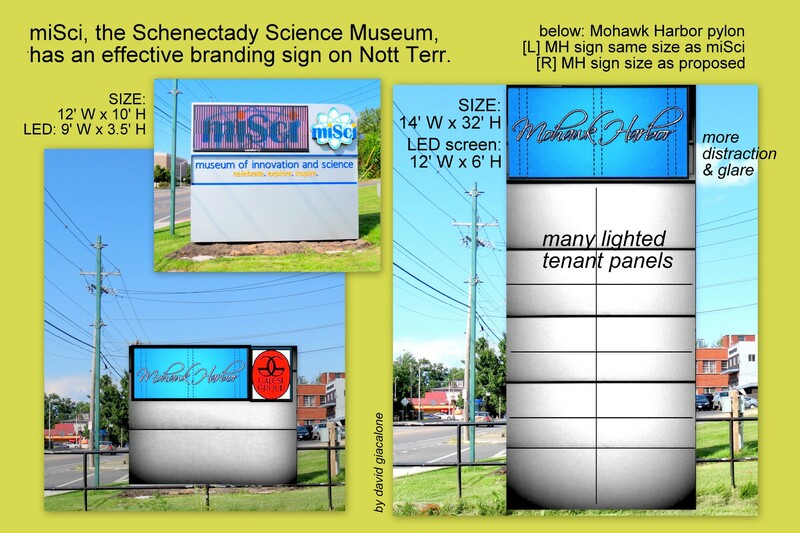 SIZE & STYLE: Given the City of Schenectady’s goals for its mixed-used waterfront district, how much leeway should Mohawk Harbor’s owners have when it comes to the size and design of its freestanding roadside signs? Mohawk Harbor is a 60 acre master planned community that integrates luxury living, high-tech offices, restaurants and retail along one mile of the Mohawk River. When complete, Mohawk Harbor will consist of over 1 million sf including 206 apartments, 50 condominiums, 15 townhouses, 2 hotels, 100,000 square feet of harborside retail/dining, 74,025 SF of Class A Office space, and one of New York State’s 1st licensed casinos, Rivers Casino & Resort. 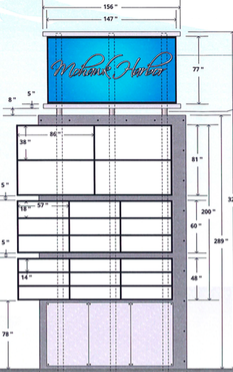 Given its stated aspirations and pretensions, it is difficult to understand why Maxon Alco Holdings LLC would want to put what is basically a “shopping center” pylon on Erie Boulevard as its branding sign, with twenty-two internally lighted tenant signs shown in the sketch submitted to the Planning Commission. 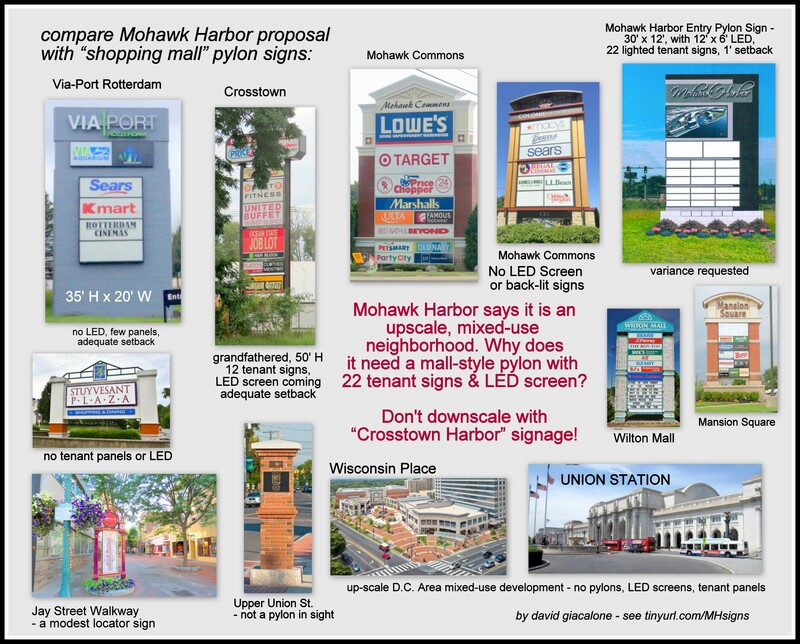 The following collage (click on it for a larger version) asks: If Mohawk Harbor is an upscale, mixed-use “neighborhood”, why does it need a mall-style pylon with tenant signs and large LED screens? Of course, such things are a matter of taste, but in my experience, it seems that the most “tasteful” shopping plazas and galleries, and mixed-use developments (such as Wisconsin Place, in Chevy Chase, MD, a couple blocks from District of Columbia’s northwest border) do not place tall tenant signs, much less huge LED screens, along their entrances. A kiosk inside the complex is far more palatable. Similar questions need to be asked about the appropriate size of the monument sign at the entryway to Mohawk Harbor. Just a block to the east, on Nott Street, the Golub Corporation has its headquarters, for its Price Chopper and Market 32 chains of supermarkets, in a building developed and owned by the Galesi Group. As you the see in the next collage, it does rather well making itself known to passersby with a freestanding branding sign no larger than 8′ H by 18′ W.
The desire of Mssrs. Galesi and Buicko to block the view of STS Steel is silly and inappropriate, and the Planning Commission and Board of Zoning Appeals should say so, especially given the brazenly excessive application for a monument sign that would be 40′ W and 10′ tall. For many of us, the STS Steel factory and complex is at least as attractive as most of Mohawk Harbor (especially its boringly ugly Rivers Casino neighbor), and symbolizes much of what was best in Schenectady’s history and desired for its future. The Planning Commission cannot simply trust the taste and good intentions of the Applicant. It must do its job, along with BZA, to assure that the size and design of Mohawk Harbor is consistent with the goals of the C-3 district, and the best interests of our entire community. 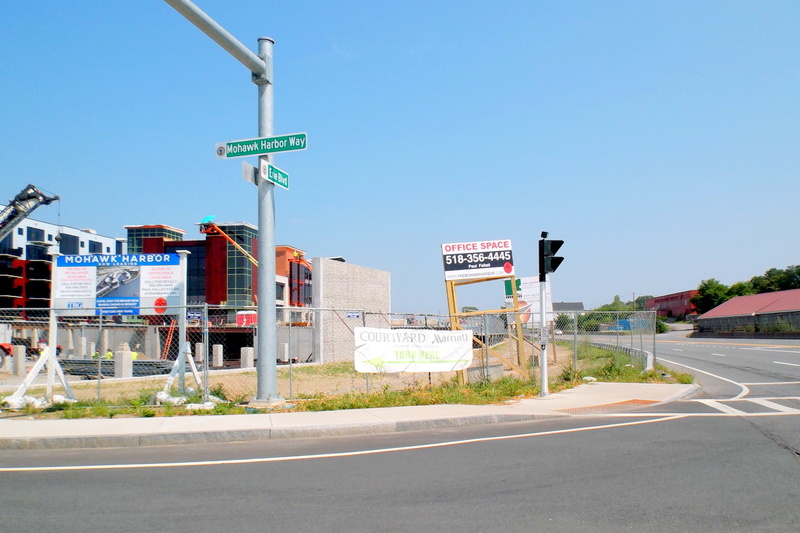 That includes people who will soon be living at Mohawk Harbor or across the Boulevard in new homes, and those investors the City hopes to entice to take a chance on new businesses across from Mohawk Harbor. 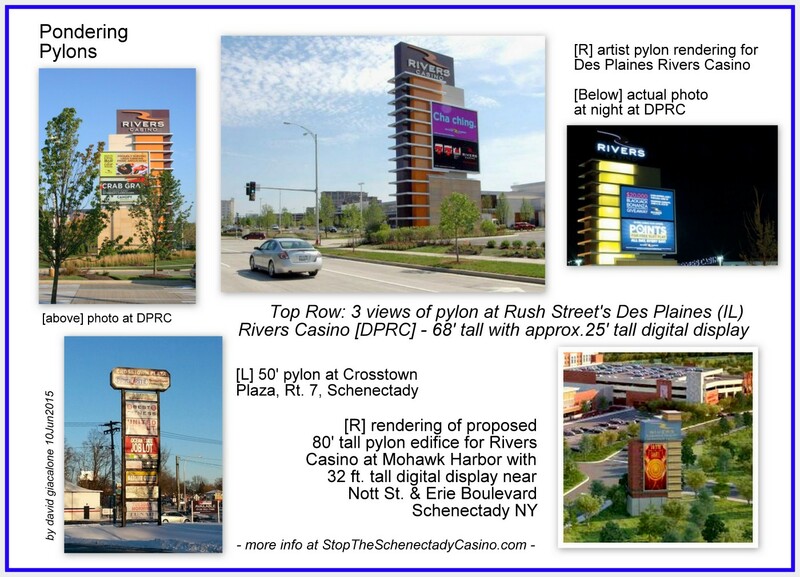 Despite the Schenectady Gazette‘s misleading headline this afternoon, “Pylon sign plan killed at Mohawk Harbor” (March 23, 2016, by Haley Viccaro), there is no way Rush Street will do without a giant “branding sign” or give up the monster LCD screen at its Schenectady Casino. Reporter Viccaro did at least point out that the casino could in the future seek to have a pylon. In fact, they still have plenty of square footage to use, given City Hall’s overgenerous 19,000 sq. ft. signage limit. The pylon sign plan has not been “killed”, it has been postponed, and your headline does the public a disservice. Rush Street has certainly not promised there will be no huge pylon or giant LCD screen. It is more likely that the Planning office or commissioners are not satisfied with the latest version of the pylon and Rush Street is not willing to postpone approval of the rest of its signage. Let’s hope this isn’t a bait-and-switch deal. When or if the casino operators complete their full sign package, let’s hope they ultimately give the public plenty of notice, including a look at drawings of what the sign or signs will look like from the street. And if the operators plan to go back to the giant pylon idea, they should let everyone know now, so the proper studies on its impact on surrounding neighborhoods can be thoroughly prepared and analyzed. At the foot of this posting, I’ve placed my online Comment to this editorial, which focuses on the lessons our leaders should have learned about rushing to embrace the exaggerated demands of the Casino Gang. As I told Paul Nelson of the Times Union when he called for a quote Wednesday afternoon, if lawyers, adolescents, realtors, or developers are being ambiguous, you can bet they are hiding something. [I momentarily forgot to put politicians in the list.] 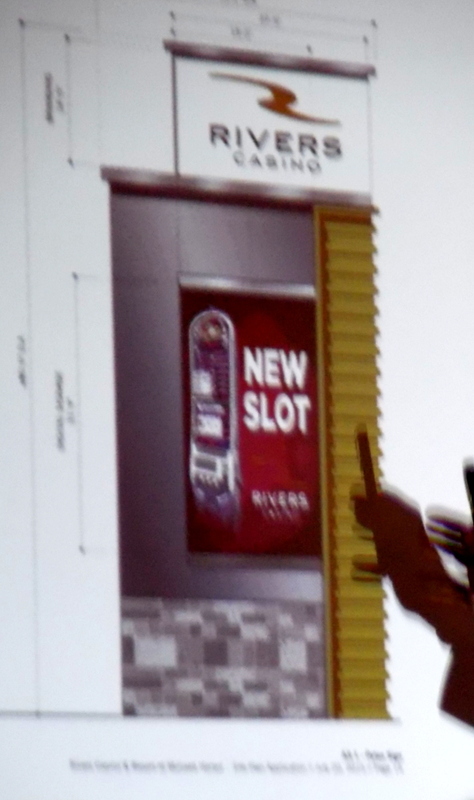 See the initial TU piece here: “Schenectady casino operator scraps towering sign plan.” Nelson updated that piece with me details, with the sub-headline “After critical feedback, developers pull back, but opponent still skeptical”. When the public said the pylon design was too tall and too wide and too bright, Rush Street, made it wider (going from 38′ to 39′), moved the branding sign even higher by eliminating a small chimney-shaped lightbox on top, and went from a black background to an intensive white background and white framing. Of course, they have never asked the main pylon opponent [me] for any feedback. It is also rather annoying that I was not able to get the Chief City Planner, Christine Primiano, to bring my latest request that the Commission require a Visual Impact Assessment before the Planning Commissioners. Chris told me I should wait until the pylon has been put on the agenda. That is, of course, about the surest way to ensure there will be no additional study. Without a visual impact resource assessment of the giant pylon signage, at the final proposed location and size, Schenectady will be buying a Pylon-in-a-Poke. If Ms. Primiano has in fact informally passed on my arguments about the requirement for a visual impact assessment to the Commissioners, or to the new Chair, Mary Wallinger, and this has helped in Rush Street’s decision to postpone submission of a pylon plan, I am grateful. Thank you for an excellent editorial that touches on many of the most important points relevant to the Pylon. When Rush Street comes back with a new version of a giant, free-standing sign or LCD screen, it needs — as you have said — to submit an independent visual impact assessment for the proposed size, location and orientation of the structure. Only then can we begin to estimate its effects on residents and traffic nearby and on the overall skyline of our City. I hope City Hall (from the Mayor and Corporation Counsel, to City Council and the Planning Commission) has learned a very big lesson. 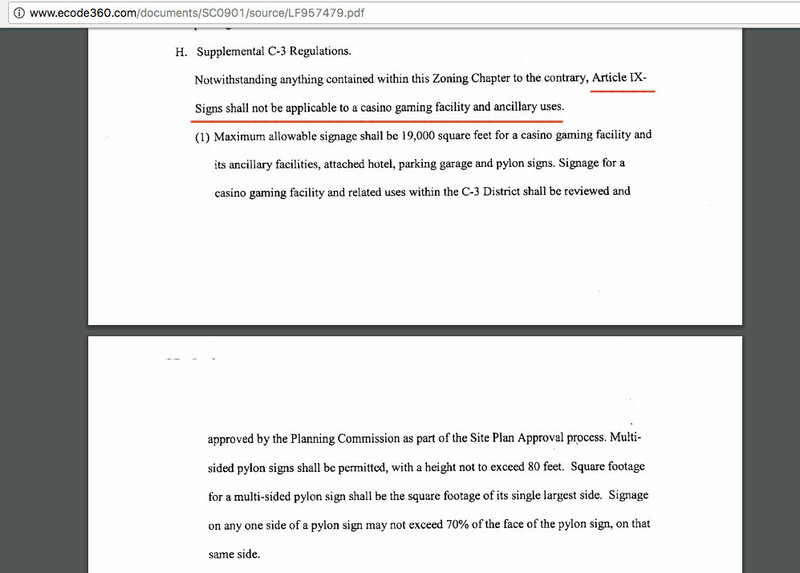 They Rushed to change the zoning signage restrictions from allowing one 7′ freestanding sign with 75 sq. 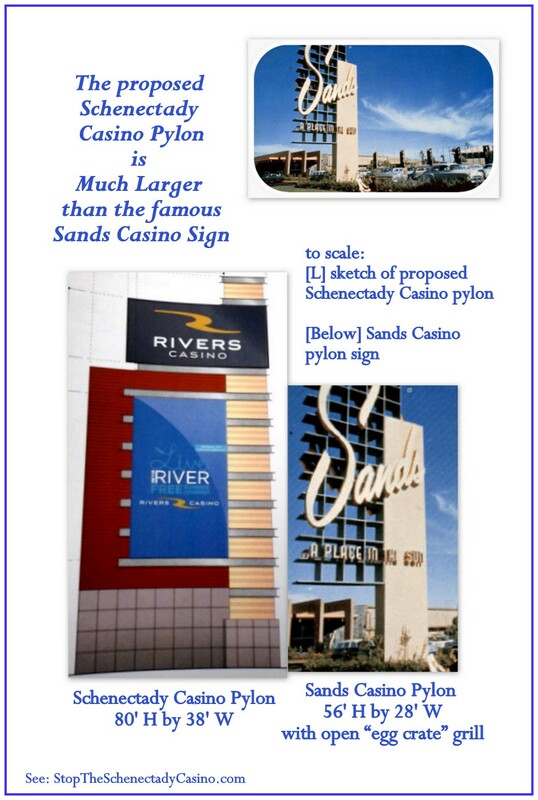 ft. of signage, to 80′ tall and virtually no limit; and from a pylon with an 8′ wide sign and 5′ wide base to no limit on the width (resulting in a proposed pylon 38′ wide); and, they did it in a Rush, solely on the very specious claims of needing the monster pylon for the casino to be seen and for Erie Blvd. traffic to know where to turn soon enough to safely enter the traffic rotary. One example: In justifying the City’s request to amend the zoning law and allow a 20,000 sq. ft. limit on signage for the casino, Corporation Counsel told me the Casino started negotiating by asking for 100,000 sq. ft. He seemed to have forgotten that the Casino told Metroplex and the Racing Commission it would need at most 15,000 sq. ft. And, now it has submitted a plan for about 8,000 sq. ft.
City Hall and the public need to keep the Casino’s gross exaggerations of its needs in mind whenever they come asking for special treatment. They need to be watchdogs protecting the public, not cheerleaders repeating the casino’s claims, or weaponless Snowmen guarding the gates of our City like on the night of the 1690 Massacre. Our leaders must take their time, use common sense, ask probing questions, and require full submissions about the factual basis of an Applicants’ claims and deadline assertions, especially on projects as big and important as Mohawk Harbor and its Casino. As it stands now, the pylon sign is generally framed on two sides by a contiguous white vertical and horizontal band and does not feature any glass, as was previously discussed. It’s unclear if that white band will be lit. The rendition to the right was included with the TU article, and was apparently provided by Rush Street Gaming design consultant Mike Levin. Levin said the Planning Commission already approved the height of the sign, which complies with city code, and that will not change. Stockade resident David Giacalone, who has spoken out against the casino project, said a relatively inexpensive computer-generated visual impact analysis by an independent organization would help allay anxieties some people have about the brightness of the pylon sign on nearby residential neighborhoods. protection of adjacent or neighboring properties against glare or unsightliness or other objectionable features. Thorough and objective application of Schenectady’s Site Plan standards should, we believe, require the Planning Commission to reject the proposed pylon or approve it with adequate and specific restrictions as to size (both height and width), brightness, proximity to roadways and residences, and use and size of LCD displays. Refusing to approve the pylon as proposed is particularly appropriate, given the failure of Rush Street to provide renditions of the structure showing its precise location in relationship to roadways and the rest of the casino compound and other Mohawk Harbor buildings, parking lots, etc. Furthermore, with no Visual Impact Analysis, including a line of sight survey, indicating where and how the pylon sign will be visible in the day or the night, the Commissioners do not have sufficient information to make responsible decisions about a monumental sign that would dominate our skyline and surely become the symbol of Schenectady to the rest of the world. For amplification of the points made above, see the postings and materials listed in the Pylon Directory at the top of our Pylon Envy posting. “bait and switch along the Mohawk” (July 31, 2015) suddenly we have a v-shaped pylon with an LCD screen on each wing. – “casino site plan approved: pylon, too” (July 22, 2015). And, the pylon will be bulkier, brighter and wider than expected. – “the Commission should require a better pylon” (July 20, 2015) The Planning Comn has the power to insist on a safer and better-looking pylon. – “a Pylon Precis: too big, too bright, too much” (July 16, 2015): a pithy summary. – “how big is 80 feet by 38 feet?” (July 12, 2015), which points out that the proposed pylon sign is both taller and wider than Schenectady’s former Masonic Temple, at 302 State Street. – other pylon-related materials: (1) Comments submitted to the Planning Commission June 17, 2015, which stresses the inappropriate height and width and the serious traffic hazard from the huge digital display. (2) a discussion of variables for evaluating the safety of roadside CEVMS (digital variable message displays). (3) The Casino’s Visual Resources Assessment submitted by the Mohawk Harbor applicants as part of its environmental impact assessment, concluding that the project would have no negative visual impact on the City or any historically sensitive areas. 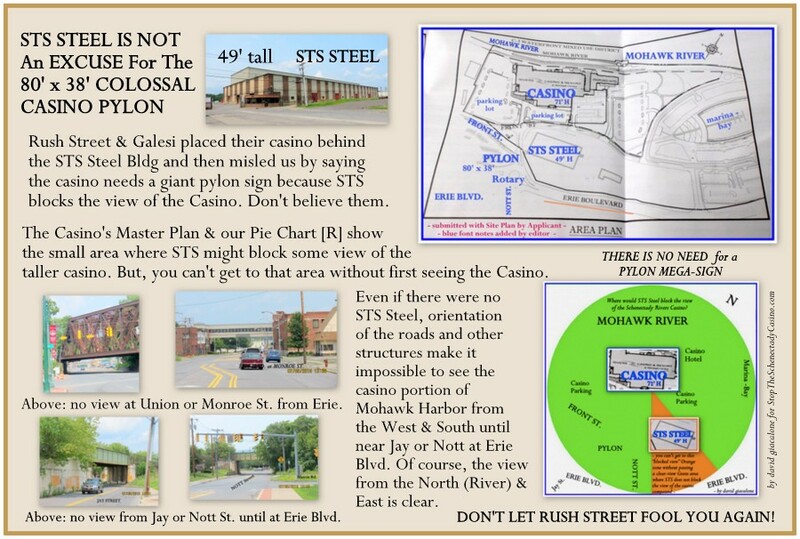 Right after giving the Planning Commission the easily-refuted excuse (see our posting “phony pylon excuse“) that they needed an 80′ pylon because the STS Steel building blocked the view of the Mohawk Harbor’s 71-foot tall casino, Galesi Group COO Dave Buicko assured them it would be “classy”, not gaudy. Sitting in the small Commission meeting room that evening, I remember smirking over what Mr. Galesi, Rush Street’s Neil Bluhm, or Gaming Industry folk in general might think of as “classy”. above & Right: photos of the 1960’s “Glitter Gulch” from the Classic Las Vegas website. For more images and history see InOldLasVegas.com. The crowning glory though was the roadside sign. It was a departure from the usual sheet metal and neon displays that beckoned road-weary travelers to stop and stay. [Architect Wayne] McAllister designed a 56-foot (the S alone was 36-feet) tall sign, by far the tallest on the highway at that time. With its elegant modern script, the sign blended with the building to create a mid-century modern paradise. The sign and the building had motifs common to both. The sign was fabricated by YESCO. With its egg crate grill, cantilevered from a solid pylon, it played with desert light and shadow. 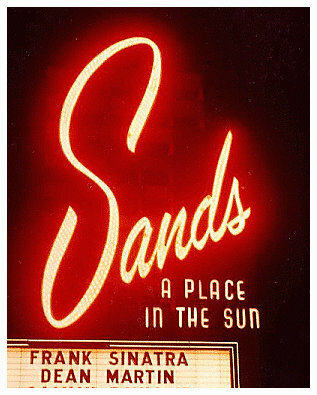 In bold free script, it proclaimed “Sands” in neon across the face. At night, it glowed red when the neon spelled out the name. The sign Mssrs. Bluhm and Buicko want to plop down in Schenectady will never be mistaken for elegance. There will be no playing with light and reflections off our lovely Mohawk River. Instead, a solid wall 38′ wide will call to mind supersized versions of monument signs straddling huge shopping center parking lots, or maybe a gaudy mausoleum. 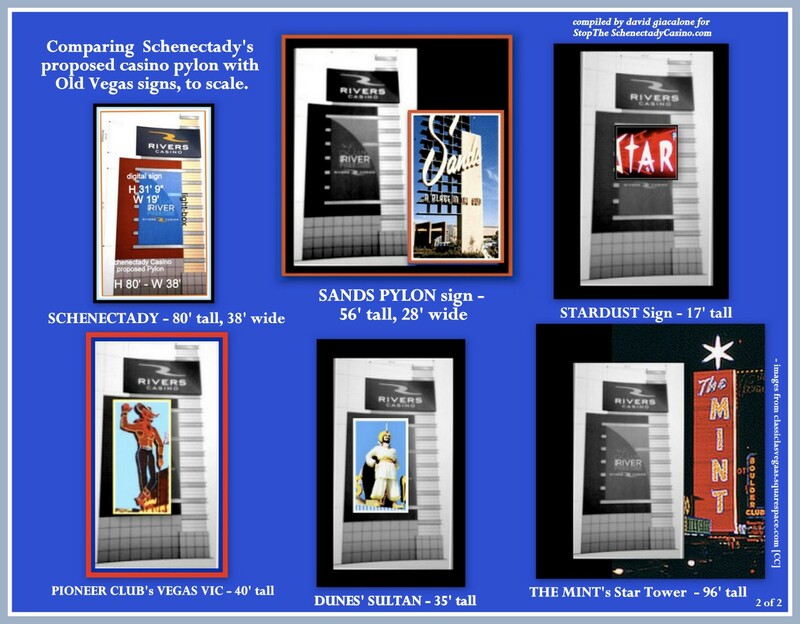 One particularly worrisome aspect of the comparisons above is that the 32-foot-tall electronic display screen on the Schenectady casino pylon monument, with its intense LCD lighting, is itself about the same size as the behemoth Dunes Sultan, giant Vegas Vic cowboy, and elegant Sands “S”, which were all created to be impressive giants. What kind of corporate or personal narcissism seeks to impose a massive, obtrusive and uninteresting monument on the City of Schenectady that is so much larger than the classic giants of Las Vegas’ classic era? What kind of civic insecurity would allow such a structure to mar a city’s streetscape and skyline? A Modern Comparison. 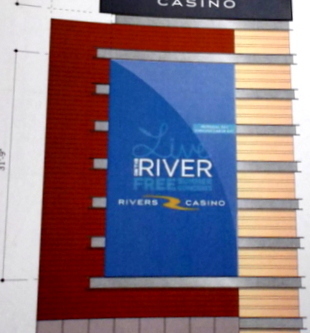 A contemporary casino sign of massive size in Cincinnati should also give our Planning Commissioners a lot to contemplate as they decide on the appropriateness of the proposed Rivers Casino pylon for Schenectady and consider the kind of design that might fit in with and enhance the Schenectady scene. Richard Unger, a city planner who recently moved to the Stockade from Florida, set out to find large casino signs in existence that might offer Schenectady some useful ideas on the design and dimensions of the main freestanding sign for Rivers Casino at Mohawk Harbor. 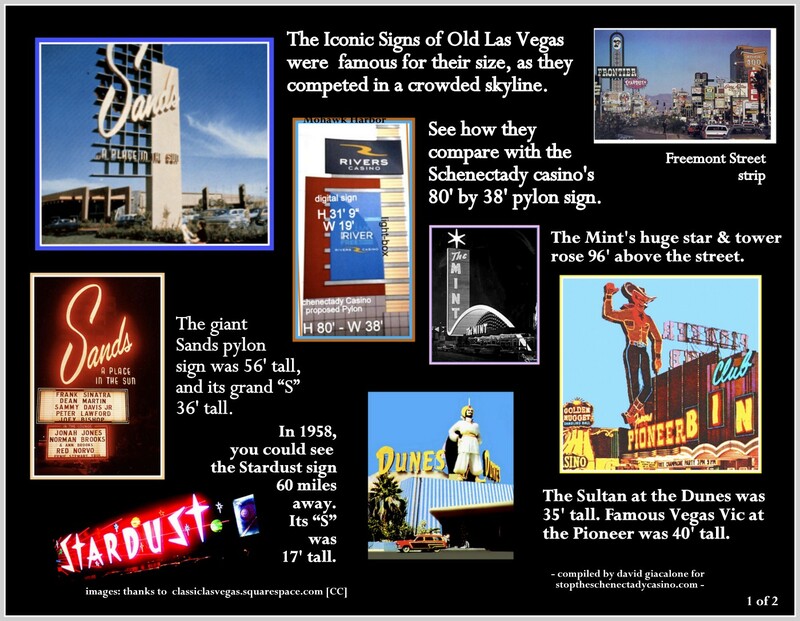 In his search, he located only one casino sign that was a large as 80′ tall. It is the massive marquee sign for the Horseshoe Casino in Cincinnati, Ohio, which is also 80′ tall. The 80′ Horseshoe sign was endorsed by community groups in Cincinnati. (e.g., see “Cincinnati casino goes all-in with giant sign“, Cincinnati.com/Gannett, Oct. 26, 2012). It should not be surprising that prior to persuading community leaders to embrace its massive marquee, the casino developer engaged in a dialogue with the community. Even less surprising, the casino-community dialog was nurtured because City Government commissioned a large study and set up a nonprofit organization, Bridging Broadway, “whose mission is to maximize the new casino’s positive effect on Greater Cincinnati . . . as a catalyst for improving the quality of life for downtown Cincinnati, its businesses, and neighborhoods.” As a result, the 150-page “Broadway Commons District Plan” was created. Click here for a half-dozen select pages from the Executive Summary and Introduction to the Study, and from the Plan’s Primary Implementation Recommendation: A Community Benefit Agreement. As stewards of the community trust in accountable development, local officials play a critical role in developing these agreements. . . . When a local authority has leverage to approve requests from the developer, these officials should represent the community’s interest. In recent years, many local officials have used this leverage to require that the developer negotiate and sign a CBA. Cincinnati is a “high-rise” City. Its highest building is 660 feet, and it has 25 buildings taller than 250 feet. (See Wikipedia) In contrast, Schenectady’s tallest building is Summit Towers, at 148′, which architects would call “low-rise” residential. The next two tallest are The Lottery Building at One Broadway Center [111′] and the Parker Building next to Proctors at 99′). A slender shape. 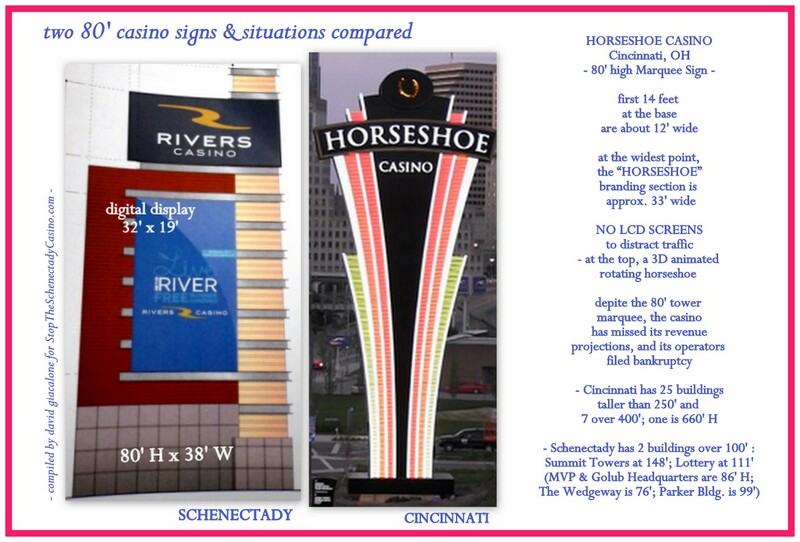 The Cincinnati Horseshoe sign is not at all shaped like the proposed giant hulk at Mohawk Harbor, which is 38′ wide for the first 60 feet above the ground, and 30′ wide for the next 14.5 feet. The Horseshoe marquee is about 33′ wide in a narrow strip near the top that names the casino. At the base, it is about 12 feet wide and stays that size for more than a dozen feet up the column. This slender silhouette greatly reduces the bulkiness of the Horseshoe sign. The Cincinnati sign looks like a casino sign, not a wall with a big LCD screen. In case our local officials are afraid to say no to the Rush Street pylon request because they fear the casino really does need the colossal sign to succeed, we note that Rush Street claims to be doing just fine in both Pittsburgh and in Philadelphia, and have no giant pylon at either location. Exempted from the “normal” Signage Rules. 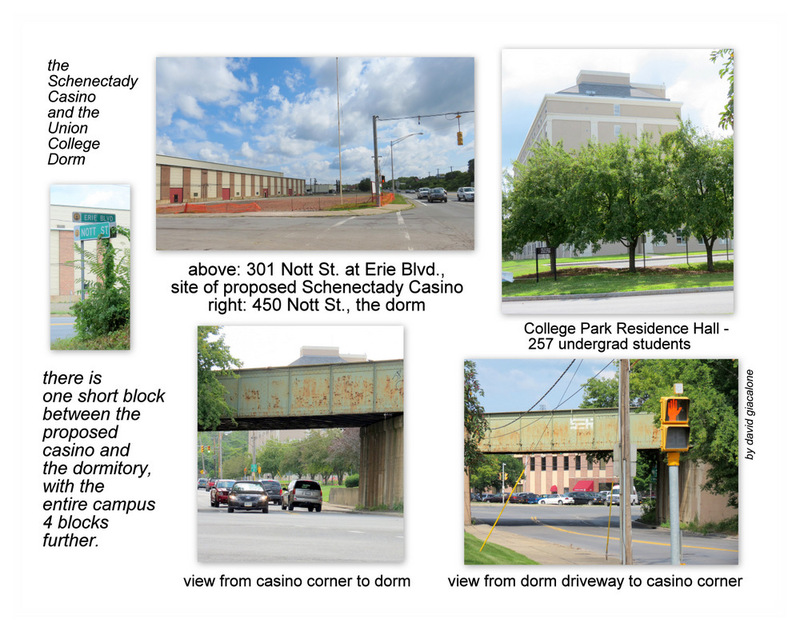 Another way to look at the appropriateness of the proposed Schenectady Casino pylon is to compare it with the rules that govern every other location and business in the City of Schenectady.